WINDSOR, Vt. — Surrounded by farmland, the river, and the rolling slopes of Mount Ascutney, Cedar Hill Continuing Care Community is the perfect setting to incorporate locally-grown foods into their menus. With a farm-to-table approach that includes local sourcing, they do just that, bringing a variety of local, seasonal foods into the community’s kitchens. Chef John Vigneau, Dietary Director at The Village, is originally from Walpole, New Hampshire, and now resides in Charlestown. He started in the restaurant business about 14 years ago. 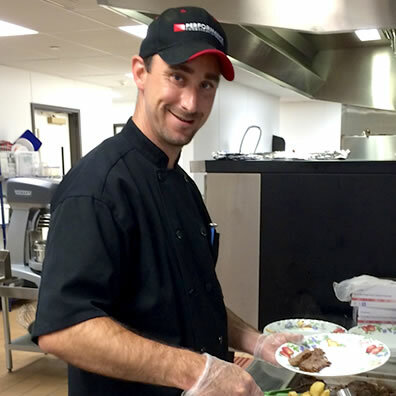 After catering a party one day, he transitioned from the restaurant business to become the Dietary Director for The Village. “It’s quite a big change,” he said in a recent interview, adding that he enjoys working for Cedar Hill. Vigneau said he purchases locally grown produce and other foods from farms and dairies in New Hampshire and Vermont, such as Thomas Dairy and Green Mountain Creamery, as well as from growers in New York and other nearby areas as needed. Cedar Hill buys local breads, produce, and locally-raised meats and beef, and seafood caught fresh out of Boston. They even purchase maple syrup from Cedar Hill residents’ families who are local maple producers. Cedar Hill incorporates local “into everything we do,” he said. He oversees the Village kitchens, working with the two main cooks Katie Taylor and Corrine Kelly. Janet Buik serves as Director of Food Service at Cedar Hill Health Care Center, the skilled nursing facility on the campus. Buik was out on medical leave while this story was being reported. Cedar Hill has won multiple awards from the Vermont Health Care Association, an advocate for quality care and collaboration between Vermont’s residential care, nursing, and long-term care communities. 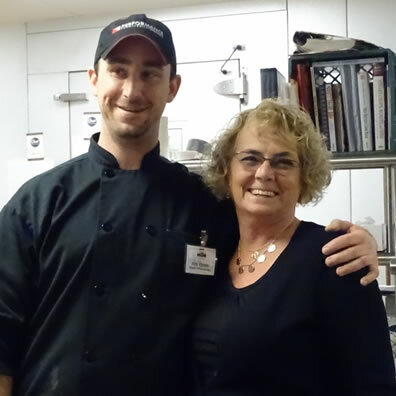 In September 2017, for food service, Cedar Hill Health Care Center’s Liddy Merritt won an award for Skilled Nursing Facility Cook of the Year; and Joshua Martini for Dietary Aide of the Year. Residents have also expressed their satisfaction. Village resident Betsy Simon said recently that she has been at Cedar Hill for about a year, and enjoys living there. What does she like the most? “Great food!” she said. At The Village, breakfast is the most vibrant time of day, a favorite mealtime for many, with lots of social interaction and conversation. The residents and staff also celebrate holiday events with Open Houses at Christmas, Easter, Mother’s Day, and Thanksgiving, as well as the annual Family Picnic, a tradition since 1989. “We cater by what’s local and what’s in season,” such as asparagus and pumpkins from the MacLennan farm next door,Vigneau said. The owners of the farm also bring down pumpkins each fall, in a big tractor bucket, so the residents can have fun decorating them all. Cedar Hill’s local, farm-to-table practices also include responsible food waste recycling and management. Cedar Hill, which joined the Vermont state-mandated food waste composting program in 2017, was recently awarded the Certificate of Environmental Stewardship from Grow Compost of Vermont for diverting 34,800 pounds of food scraps from disposal in 2017. Vigneau said the weight “reflects how well we reduce the scraps in the landfill. A lot of the compost consists of all the fresh produce/proteins that we use on an annual basis. Much of the weight comes from vegetable and fruit peels as well as some liquids that may end up in there. “Cedar Hill’s waste hauler changed composters in 2018 so Cedar Hill is still composting, but not with Grow Compost,” said Patricia Horn. “It has brought awareness to most employees at Cedar Hill on composting and the benefits,” added Cedar Hill Health Care Administrator Cathy Leone. Cedar Hill is a Vermont family-owned and operated company. For more information on The Village at Cedar Hill, the Judith Brogren Memory Care Center, or the Nursing Facility and Cedar Hill Health Care Center, visit Cedar Hill’s website at www.cedarhillccc.com, or call them at (802) 674-6609.